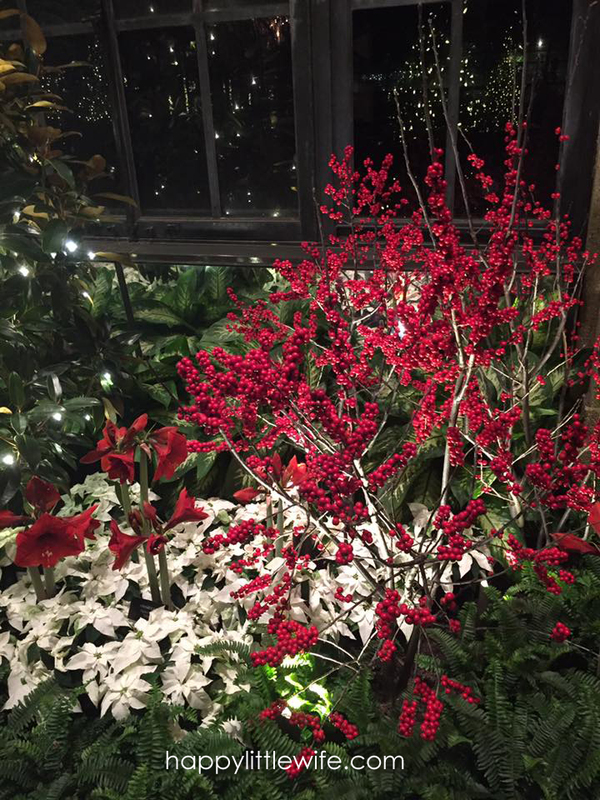 Our family has had a membership to Longwood Gardens for the past three years, but we’ve never managed to get there to see the Christmas displays. It either gets too cold or our schedules get too crazy. This year I was determined to get there. Last week’s weather was very mild and we made it a point to clear our schedules to visit. The kids – ages three and five – were looking forward to seeing the lights and our son couldn’t wait to see the train which is only on display during the Fall and Christmas seasons. But it wasn’t just the Garden Railway that they were looking forward to — they enjoy the Tree House and believe it or not, they are very interested in the different types of plants and flowers throughout the grounds and in the Conservatory. Since Alyssa (3) has been visiting since she was a baby and Tyler (5) has been visiting since age 2, they have become very appreciative of the beauty found at the Gardens. It is a fantastic learning experience for them and it brings me joy to see them stop and ask for us to read the informational signs to them. This past summer they were so involved in the Waterlily Display that one of the workers actually came over to them and gave them a little lesson on the plants and allowed them to touch them. During this visit as we were walking along a path, Tyler stopped to admire the lights and snowflakes in one of the large trees and he said he remembered when that was lit and there were fireflies and music. A man passing by us stopped and asked how old he was and said that he was quite impressed that Tyler was recalling “Nightscapes” from a couple years ago. I love that our children enjoy visiting here! We knew we were going to be in for a treat when we could see a tree covered in green lights all the way from the road before the entrance. 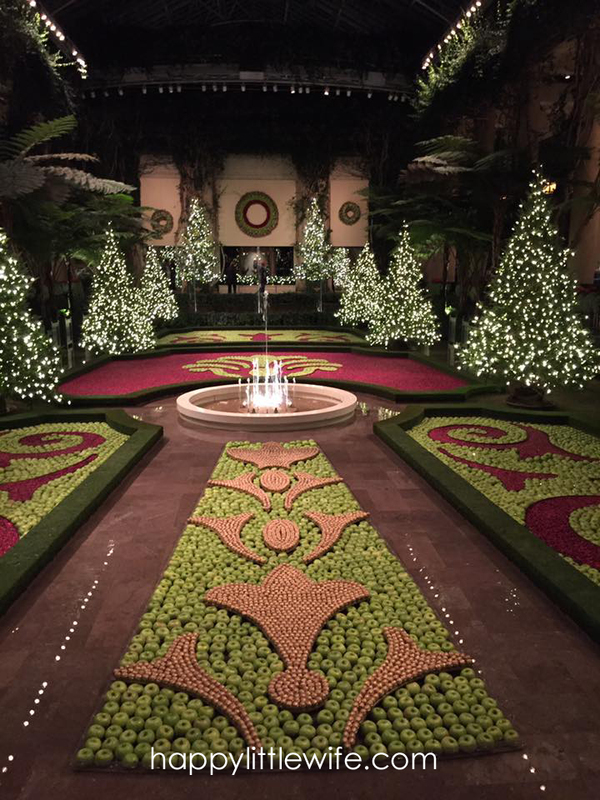 I mean, there are over a half-million lights to be seen once you enter the Gardens. 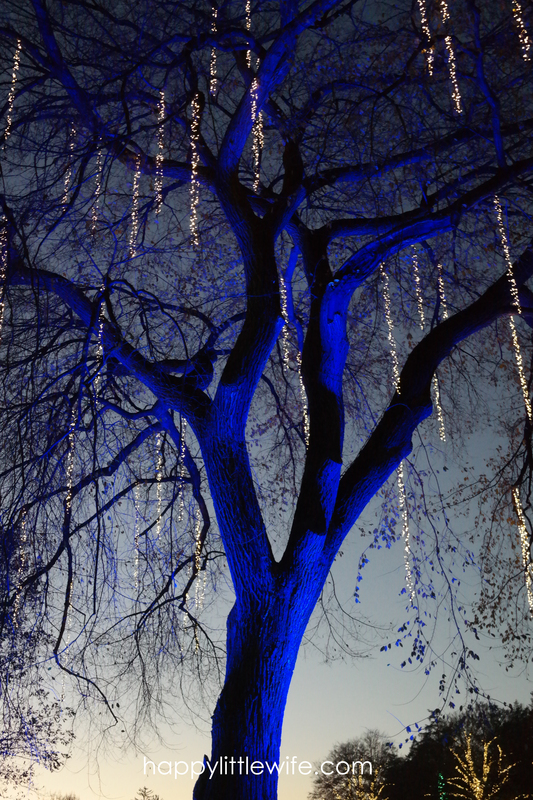 From trees illuminated with “icicles” outside to gorgeous displays inside, the whole experience is breathtaking. Here are a few of my favorite photos from our visit. I have many more, but I don’t want to spoil it for you if you want to go this season! I think the Exhibition Hall with the apples, cranberries, and walnuts was our family’s favorite part – we were in awe of the estimated 670,000 cranberries, 8,000 Granny Smith Apples, and 3,000 walnuts used to create the patterns. Crazy, right?! If you plan on visiting, be sure to check out the Longwood Gardens website for their calendar of events and for more information. The membership really is a terrific value especially if you intend on visiting more than once a year. Bundle up and take your travel mug with hot chocolate and enjoy an unforgettable experience that will become a family tradition. I would love to hear about your favorite part too! 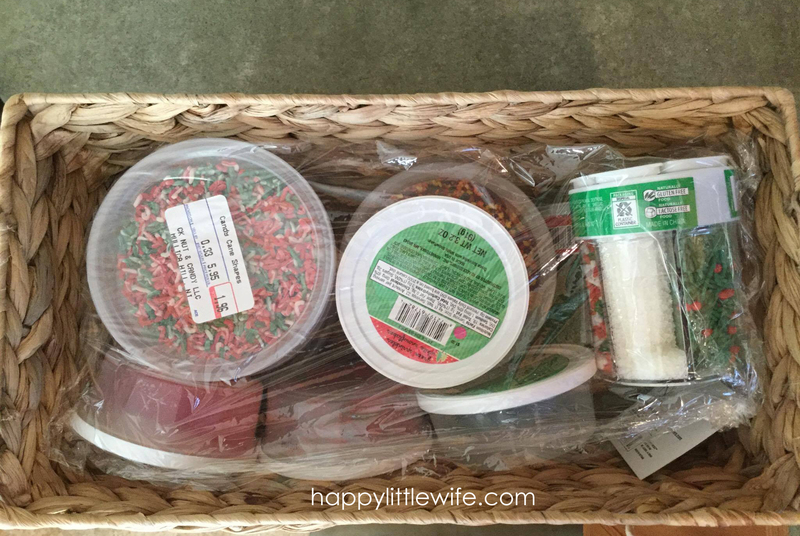 Walmart Grocery Pick-Up: Is it worth it? 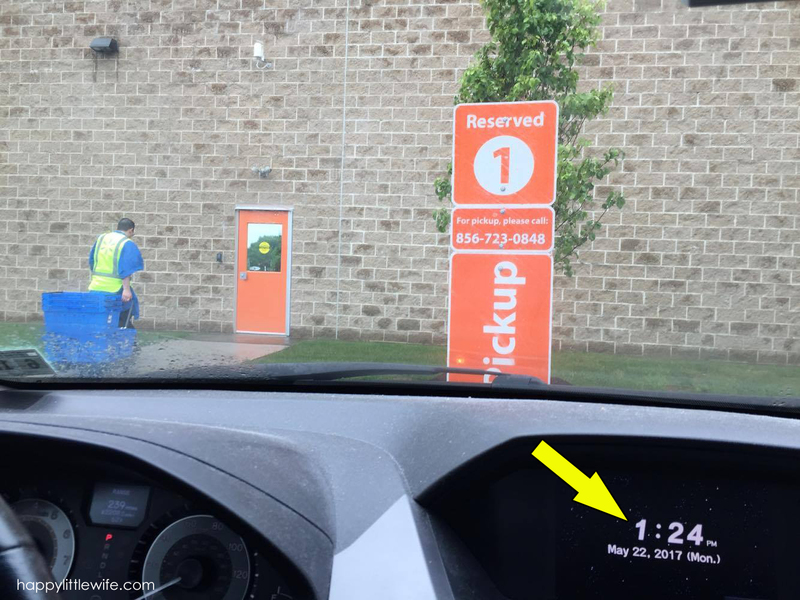 This honest review of Walmart Grocery Pick-Up is unpaid and unsponsored. I’ve been using the service and wanted to share my experience with you. I don’t know about you, but going grocery shopping is not something I look forward to — especially with two little kids. 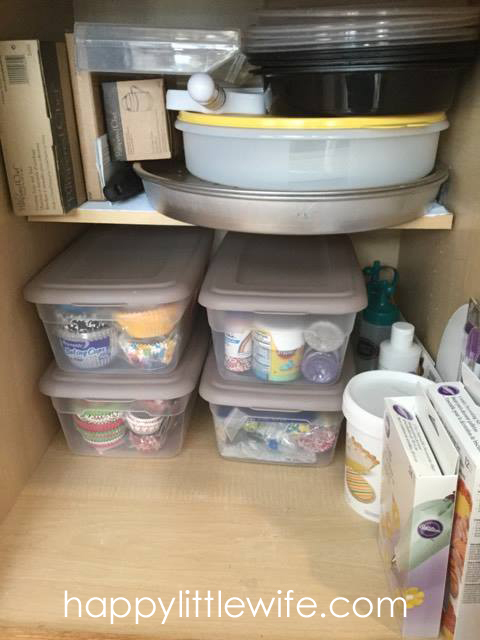 About two years ago, our local grocery store started offering Shop from Home, which I found to be a great time-saver as well as a money-saver. There were no impulse buys, no forgetting items, and best of all, I didn’t have to leave the house! It was completely worth the fee when it was freezing cold. But then I started thinking that $16 ( $10.00 shopping fee + $5.95 delivery fee) was crazy and I would do pick-up and still pay the $10 shopping fee. That was short-lived. I was too cheap. No matter how much time it was saving me, I couldn’t bring myself to spend that extra money. 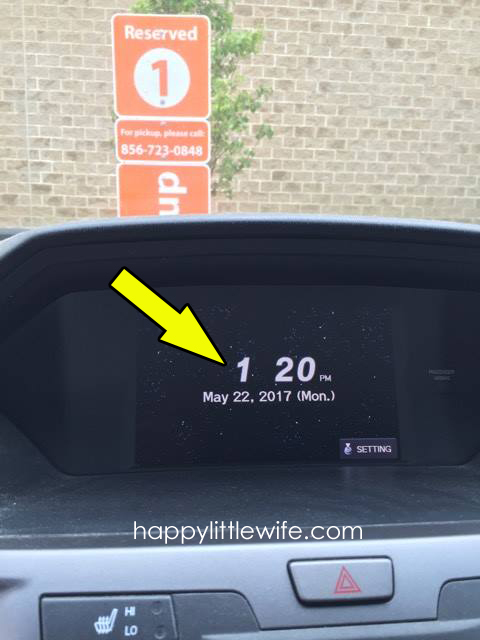 I went back to shopping late in the evening once my husband was home to be with the kids. Again, not something I look forward to because if I get some “free-time” I would rather be anywhere but the grocery store. 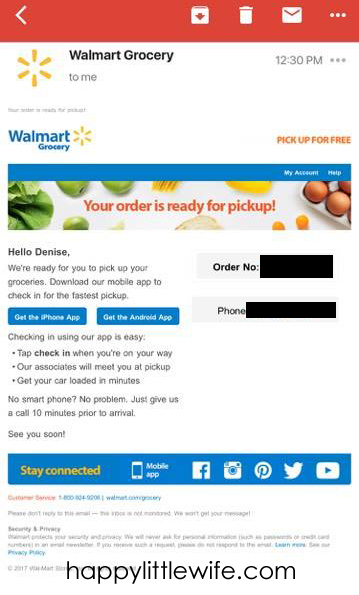 About a month ago, my local Walmart started advertising Grocery Pick-Up. Well, isn’t this just fantastic! I looked it up and guess what? There is NO SHOPPING FEE! That’s right – no shopping fee. Someone will shop for me for FREE. All I have to do is pick up my bags. I should mention that there is a $30 minimum order, but if you are grocery shopping, that’s easy to do. I’ve used the service several times now and each experience has been great. I decided to document today’s pick-up to show you how wonderful it really is. Last night I created my meal plan for the next two weeks. 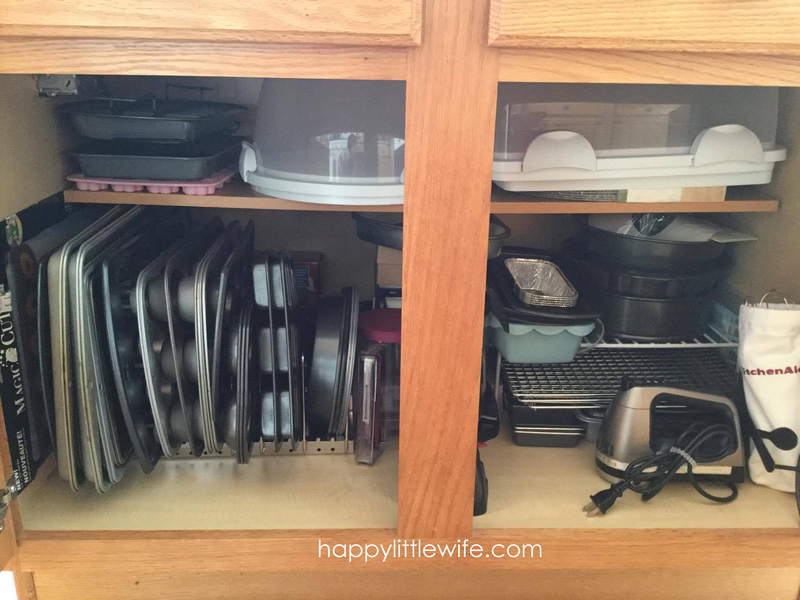 I was able to go through my Pinterest boards and pick my recipes, make my grocery list while checking the pantry, fridge, and freezer, and add all the items I needed to my cart on the Walmart Grocery website. You can use the app too – whatever works for ya! 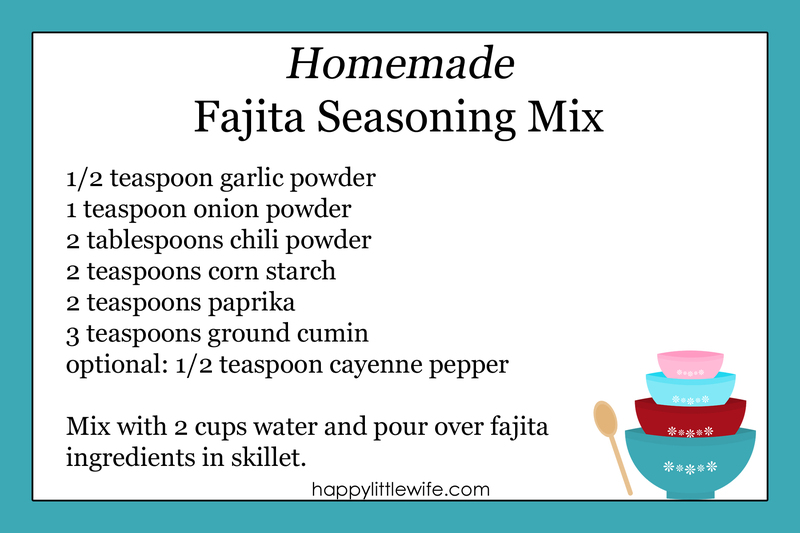 My list was fairly short because I only needed the ingredients I didn’t already have on hand. I loaded my cart, scheduled my pick-up time for between 1:00 and 2:00 p.m. today and checked out. 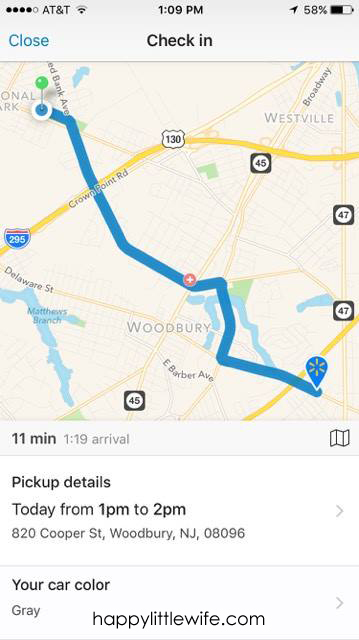 All I had to do was wait for my email that my order was ready for pick-up. I received my email at 12:30 p.m. (a half hour ahead of schedule) that my order was ready. 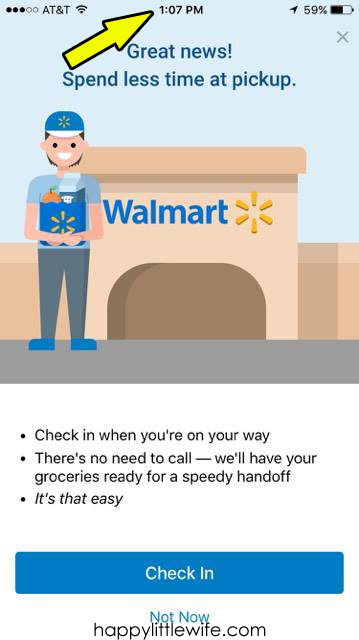 I finished my lunch and when I was ready to go, all I had to do was open the Walmart Grocery App on my phone and “Check-In.” By checking in, I was letting the store know that I was on my way and the app would track my drive so they would know exactly when I would arrive. 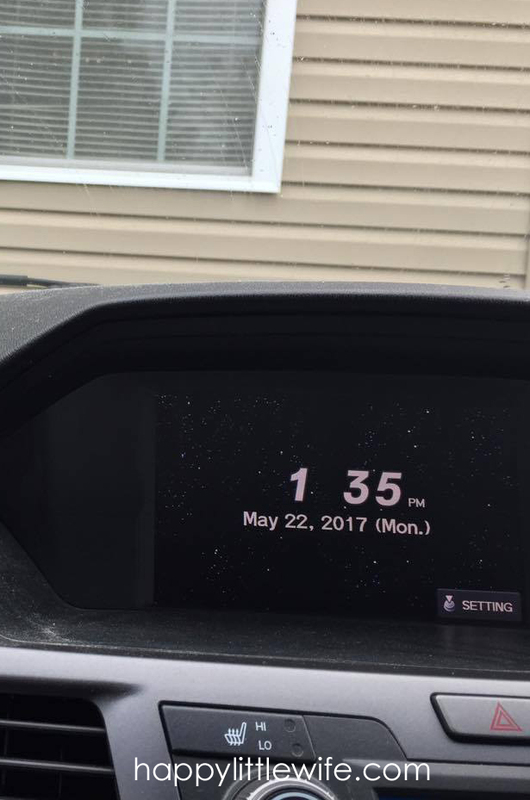 As you can see, I clicked check-in at approximately 1:07 p.m. and pulled out of my driveway at 1:09 p.m. I arrived at the store at 1:20 p.m. and within seconds, an associate came out to my car and asked if I was Denise. I said, “Yes! That was fast!” He went back into the building and walked right out with my order. It was raining and I offered to help load my bags into the car and he insisted that I stay in the car and he would get it all. He loaded all my bags, I signed that I received my order and I was on my way at 1:24 p.m.
You can see the associate walking back inside with the empty crates where my bags once were. It took me FOUR MINUTES to get my groceries. And I was back in my driveway at 1:35 p.m.
I’ll say that’s a WIN! You know what else is a win? Saving money. I knew I was saving money because I wasn’t paying a “Shopping Fee,” but I didn’t realize how much I was saving compared to my usual grocery store. So out of curiosity and because I have so much free time (hahaha) I decided to go on my grocery store app and add all the same items to my cart to see what it would have cost me. 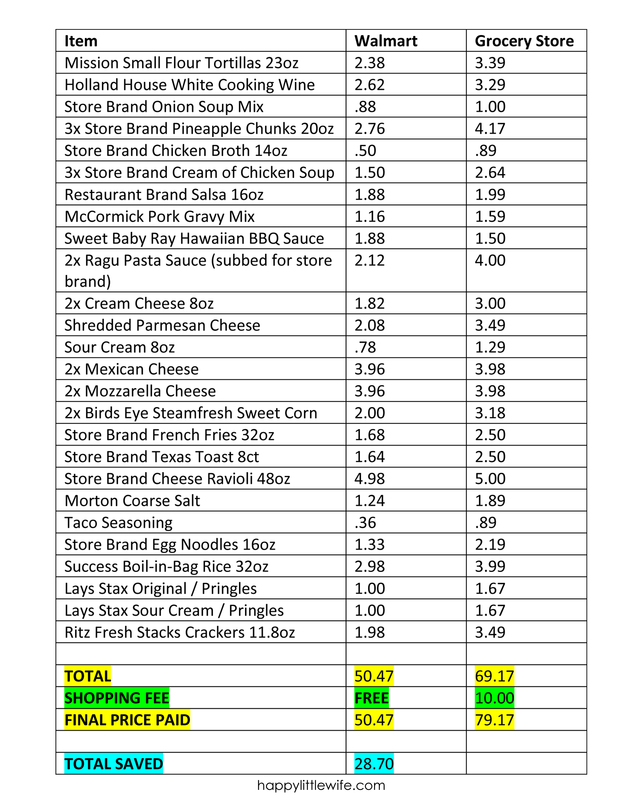 Here is my exact grocery list – yes, I made this table to show you. Do you see that?! I saved almost $30 by shopping at Walmart compared to my local grocery store. I’d say that Walmart Grocery Pick-Up is worth it! Do you agree? Want to give it a try? If you found my review helpful, you can save $10 off your first order of $50 by using my referral link below and you’ll save me $10 on my next order too! I’d be grateful! All you have to do is CLICK HERE TO SAVE $10 ON YOUR FIRST ORDER. When I say “local” I mean local to most of my current readers here in Southern New Jersey – or more specifically – Gloucester County. 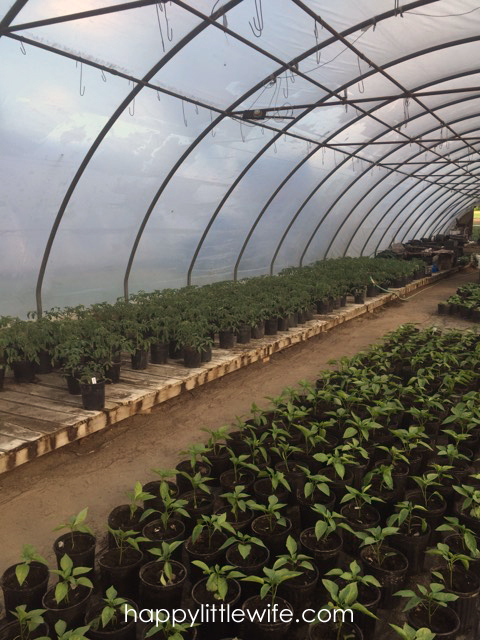 Anyway… In the one group, a local bee-keeper posted about this place with tomato plants and pepper plants for $1 each. Yes, you read that correctly. ONE. DOLLAR. Now, if you’ve been to any of the big box stores around here, you’ll know that’s a steal. The same plants sell for $3.50 and up. Now if you know me, you’ll know I can’t pass up a good deal. I immediately thought, “Oh my goodness, I need to get here. Like now!” Well, it was late at night when I saw the post, so I made sure I worked it into my plans to go there the next morning. I grabbed the address (not sure if it’s exact, but it will get you there!) 415 Breakneck Road, Sewell, NJ 08080 – I’m a visual person, so here’s a pic to help make sure you arrive at the correct place! I was just so dang excited over all this, that I felt the need to go back today. I wanted some more basil and the wonderful people in the group mentioned that it was only 50 cents! What?! RUN!!! 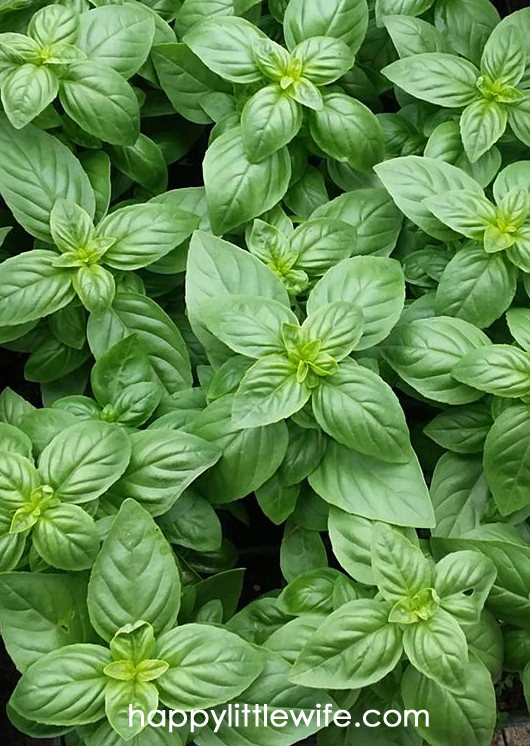 Did you know that basil repels mosquitos? I didn’t, but I do now, thanks to the terrific young woman who assisted me today. I picked up an entire flat of basil (the bigger pots of basil are $1 each), 2 Sunflowers, and another eggplant, because… well, I’m one of those people who can never have just one of anything. I forgot to take a pic of the sunflowers and it’s dark now, so I’ll add those tomorrow, but here’s the basil and a couple photos of the plants in the greenhouse. 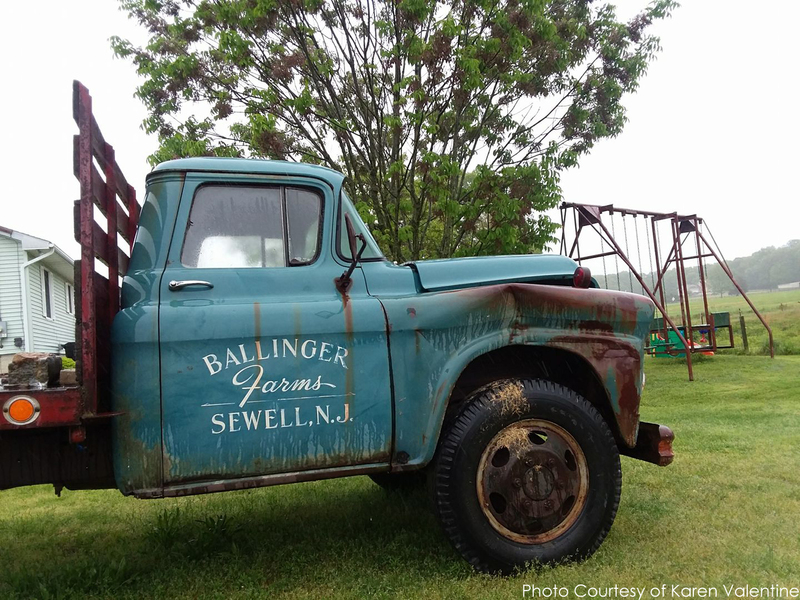 So this place does actually have a name – I learned that when I saw this vintage truck parked in the yard. 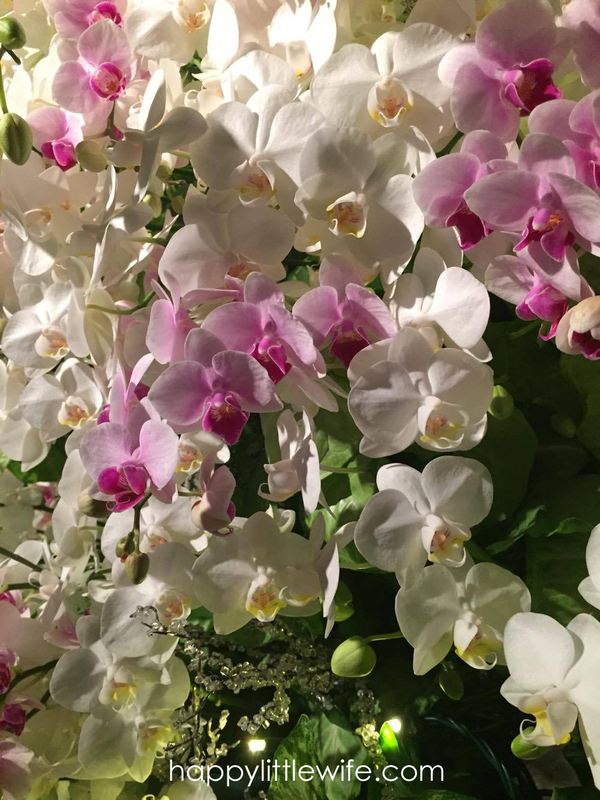 I didn’t snap a pic of it, but one of the lovely gardeners in the Facebook group had posted this photo and very graciously allowed me to share it. What I learned today from the young woman who helped me was that her great grandparents owned this farm and they want to keep it going. She, her brother, and their parents take care of it on their own and don’t advertise, but rely strictly on word-of-mouth for business. I told her that I had recently started a blog and would love to share if she didn’t mind. She was very grateful! She also told me that they will have some more flowers available – there were currently petunias available. In addition to the tomatoes, peppers, eggplant, basil, and sunflowers, there were also squash. There will be watermelons this summer! 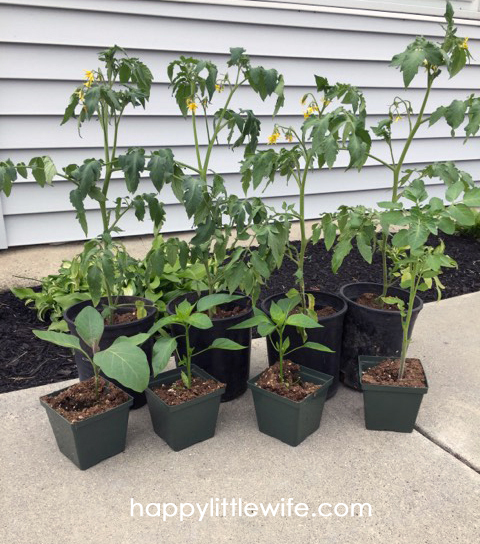 And there will be pumpkins, gourds, and mums in the fall. Let me tell you, this is one place that will be at the top of my list to visit as new things come into season. I am a big fan of “mom and pop” places – and this one is one you don’t want to drive by. You just can’t beat their knowledge, friendliness, and of course, their prices. Let me know if you check it out! P.S. As for the bee-keeper, if you’d like some local honey, you can pick some up while you are there. He said it’s also available at many other local farm stands as they open up for the season. It is $5 for a 1 pound jar and $15 for a 3 pound jar. I have always loved flowers and I love to plant them. 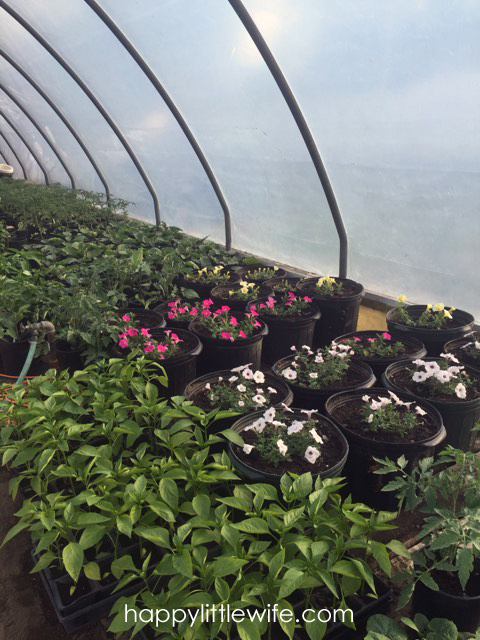 I love going to a local greenhouse, picking out my flowers, bringing them home, digging a hole, plopping them in and watering them regularly. That’s about the extent of my gardening skills. I also enjoy growing herbs on my porch and have grown a few strawberry plants. I have had good luck with my plants most years and other years, ehh… I don’t know what happens. So while I enjoy gardening, I don’t consider myself a “gardener.” Now, my one grandmother – she was a true gardener. I wish she were still here now that I’m grown so that I could get her advice. Since that isn’t possible, I’m attempting to teach myself how to truly take care of my flowers, herbs, and vegetable plants. I can’t tell you how much time I have spent searching the internet and Pinterest for information. It becomes overwhelming, and I don’t know about you, but if you’re a momma’ like me with little ones, retaining any of what you read is just not happening. I take that back. I remember some of the information, but I just don’t know what it applies to… not very helpful! And while my Pinterest boards are filled with lovely pins and all kinds of information, I just don’t see myself standing out in the yard and pulling up info on my phone. I needed a better solution. 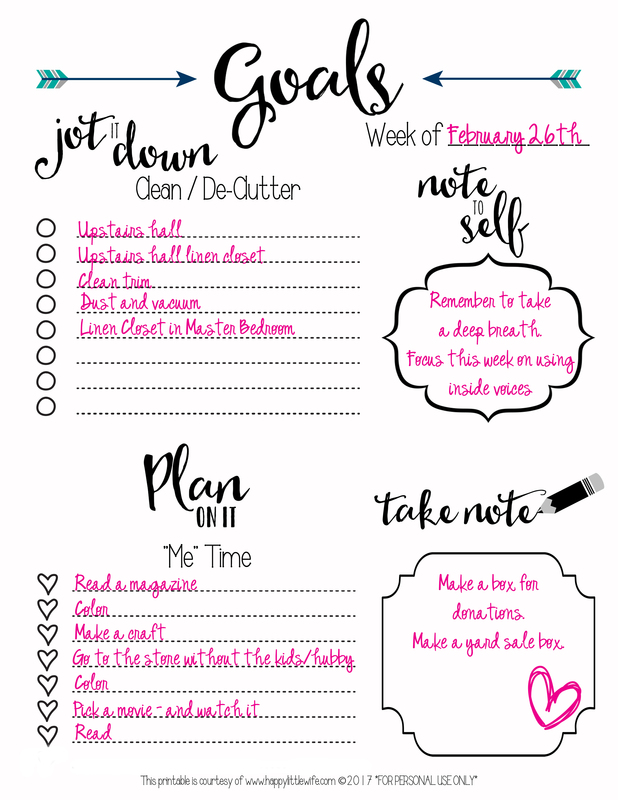 Since I’m the queen of making printable organizers, I decided that I would make myself a very simple printable. 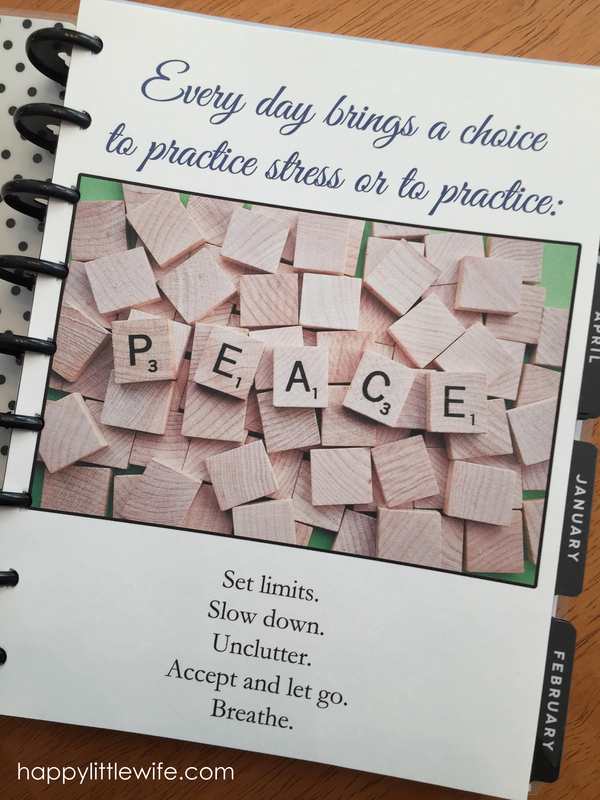 Something that would work for me — and possibly you. I know that this isn’t anything fancy, but it looks a lot better than my notes jotted on random pieces of scrap paper or list-pads. I can easily slip these little cards into a 4×6 photo album to keep them all together or if I’m feeling really motivated, I could laminate them, punch a hole in the corner, and put them on a key ring. I made a few “multiple choice” questions on the right hand side — Annual or Perennial; Sun / Shade / Part Sun; Frequency of Fertilization and Watering Instructions. How to harvest my veggies and herbs. 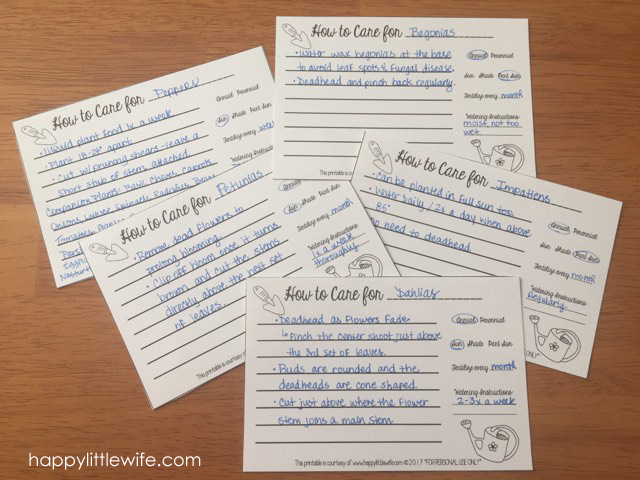 It may seem like a little bit of work and again, this may seem overwhelming, but once you compile your notecards and keep them in a safe spot, you shouldn’t have to look up the information again. You’ll just reach for your handy-dandy gardening book, created by you – for you, and you’ll be all set! Hey! Look who’s back! April was crazy busy with birthdays and Easter and I spent most of the month in the kitchen making treats, baking, and cooking. 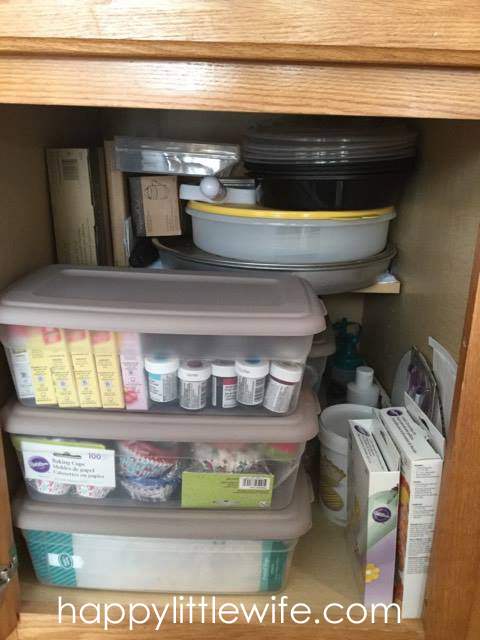 I love to bake and I have been trying to teach myself how to decorate cakes since my son has peanut and tree nut allergies and we steer clear of bakeries. This was his 5th Birthday Cake that took me a few hours to bake and decorate. I have to say, I was pretty happy with the end result. I received lots of messages through social media after I posted a picture of this cake – everyone wanted to know if the blocks were candy and how I made them. I also know that when I was looking for inspiration for a block themed cake, most of the ideas involved shaping cakes or stacking cupcakes on a cake, or something molded from fondant. Well, I’m a pretty good baker, but I need to work on my decorating skills and playing with fondant and shaping cakes really didn’t seem like a challenge I was ready for, so I decided that I needed to come up with something that I could actually MAKE myself and that would make my five year-old happy. I think I managed to do both! The cake was a chocolate and vanilla layer cake. I bought this awesome Wilton Easy Layers Square Pan to make him his own personal cake and made cupcakes for everyone else. I didn’t want to make a cake so big that it would become overwhelming to decorate, especially since I didn’t know exactly what I was going to do. 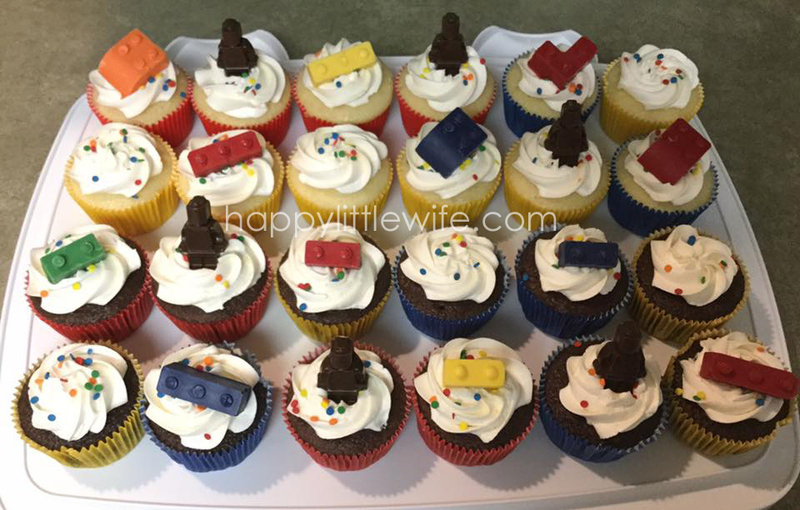 To be sure that I stuck with his building block theme, I ordered these building block silicone molds and made candy to decorate the cake and cupcakes. This was the perfect way to stick with the theme without making me crazy over how I was going to pull this off! Since we have the allergy issue here, I had to dye my peanut free white candy with these fantastic powder food colors. None of this was very difficult, but it was very time-consuming. In addition to the candy molds, you just need a Star Tip, Piping Bags, and your favorite buttercream frosting recipe. 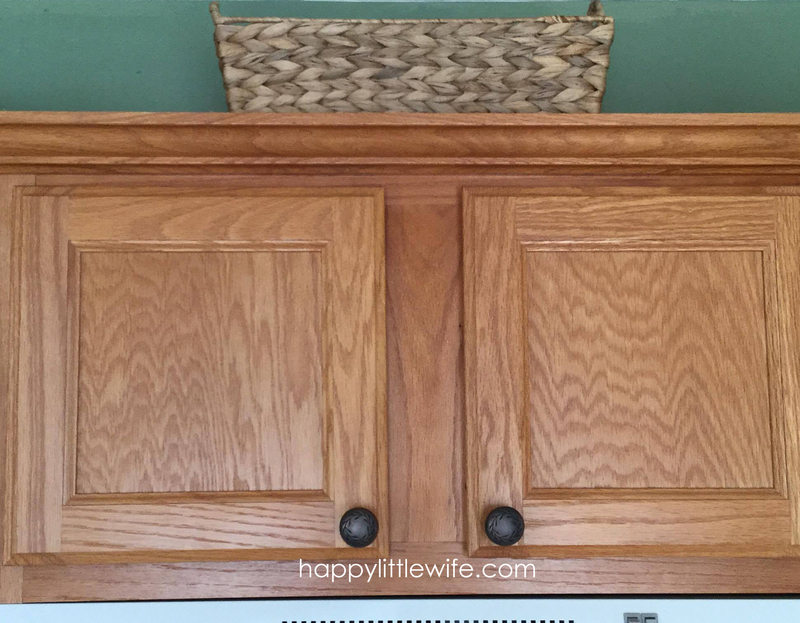 Oh, and one of these really makes decorating so much easier! 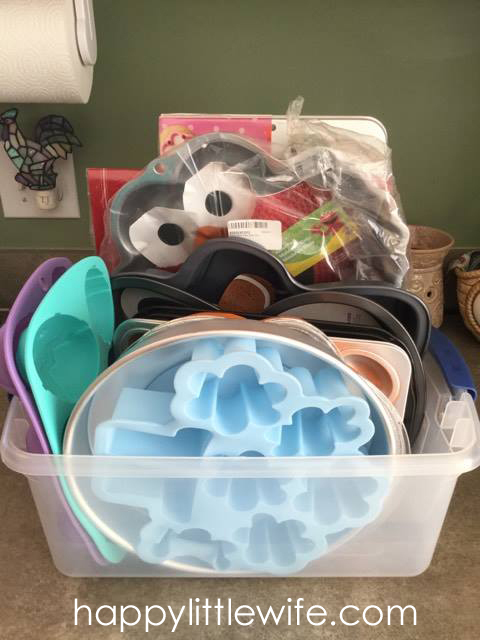 We are actually excited to use those block and figurine molds again to make gelatin and other fun treats… I think homemade gummy candies are on the list! So as you can see, this was a busy weekend in April. The following weekend was Easter and dinner and desserts were on my to-do list. And the rest of the month was jam-packed with making orders for my little handmade business. Things are finally starting to return to normal around here and I’m actually looking forward to getting back to writing and sharing with you.